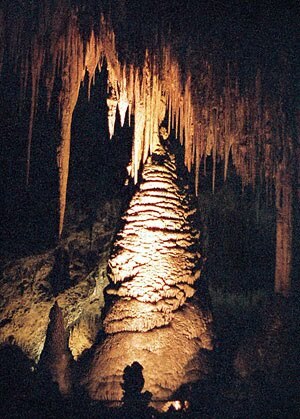 Visitors can experience Carlsbad Caverns solo, with rented portable equipment for an audio tour, or as part of a guided tour. Ticket prices for adults run $6 for a pass (that is valid for three days) and children 15 or under get in free. The tours start at $7 and can run up to $20, depending on which one you purchase. 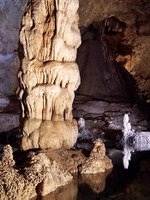 First time visitors are recommended to go it alone, with audio equipment, or take just the basic tour. The pricier tours actually allow you to go into parts of the cave off the main trail that most visitors experience, and see new chambers, making them good for a second day or return visit. NOTE: The progressively rougher terrain on the more advanced tours causes the park to bar children 6 and under from participating. 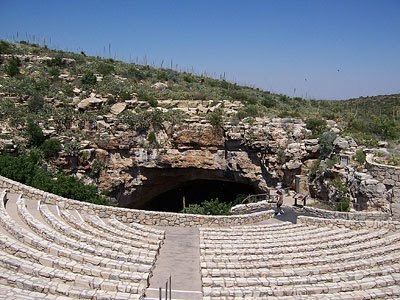 The natural entrance to the cave provides a seating area for when the bats leave the cave at dusk, and a paved path down into the cave. 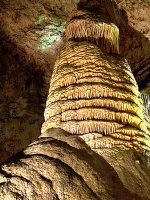 While it can get quite hot outside, the inside of the cave is comfortably in the high 50's all year long. Bring a light sweater. Visitor's center - Giftshop, Food to eat, restrooms, as well as information on the history of the park. Descent from the surface - If you're fit enough for a brisk walk down a mountain path, then I highly recommend you skip the elevator and make the descent from the surface. A gaping hole leads you into the first chamber, where light pours in from the surface, and you double back along the hillside like any mountain trail. You get to see more parts of the cave this way, and really feel like you're exploring. Once you're done, you can take the elevator back up. Elevator down - Runs every 15 minutes to and from the visitor's center. Underground restaurant/concession stand. 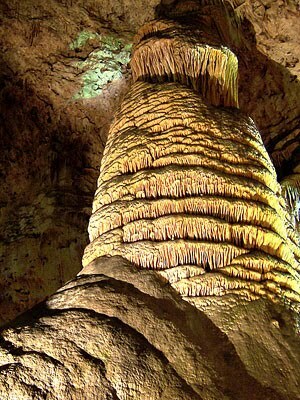 Eat a meal 700 feet below the earth's surface. Hiking Paths - If you're up for desert hiking, the surface has its own hiking trails. 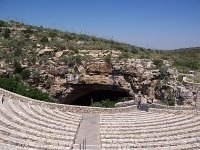 Bat Show - The Entrance to the cave has an amphitheatre shaped sitting area, where you can watch the bats come out at sunset. No cameras allowed, however. Too many jerks couldn't follow the "no flash photography" rule and were blinding the bats.